Tens of Gambir Urban Village PPSU officers are cleaning the sidewalks around National Monument (Monas), Central Jakarta.
" 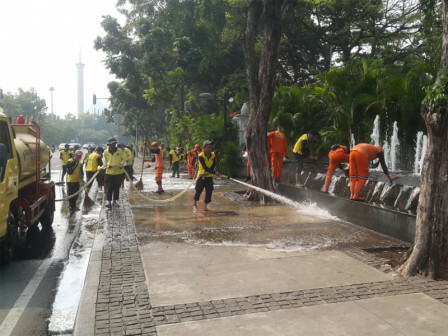 All sidewalks and fountains around Monas are cleaned"
"All sidewalks and fountains around Monas are cleaned," expressed Abdu Salam, Head of Gambir Urban Village, Monday (7/23). In the field, around 15 PPSU officers who are assisted by 30 officers of Monas Management Unit (UPK) are sent to Jalan Medan Merdeka Barat, Timur, Selatan and Utara. "The sidewalk will be painted with Asian Games ornaments," he told. He added it has been ongoing since last week.